Russell Janney (1884-1963) was born in Wilmington Ohio. His career was mainly as a Broadway producer, putting on nearly two dozen plays between 1916 and 1943. And that’s pretty much all I can tell you about Russell Janney. Perhaps I should explain how I write the author bio sections of my reviews. It starts with a trip to Wikipedia, where I find some basic biographical data (e.g. year and place of birth, major works, etc.). Afterwards, I find a biography of the individual and/or consult a biographical dictionary, to confirm the details from Wikipedia. If I include information not on the Wikipedia page (and its linked sources, as the case may be), I cite the biography in the ‘sources’ section at the end of the post. I have been unable to find any sources to even verify the scant information on Wikipedia. I could find no biographies of the man. I’ve consulted about half a dozen biographical dictionaries of American writers, and have turned up nothing. My copy of The Miracle of the Bells doesn’t even have an ‘about the author’ page. If you are truly interested in learning more about Russell Janney, I hope you have better luck than I have. 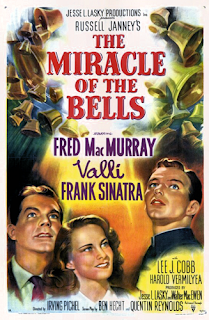 The Miracle of the Bells tells the story of Broadway manager extraordinaire Bill Dunnigan and the young movie star Olga Treskovna. The novel opens with Dunnigan bringing Olga’s body back to her home town, a small Pennsylvania coal mining town known only as Coaltown, in accordance with her wishes. From there, the novel switches between the present in Coaltown and Dunnigan’s flashbacks of the events leading to Olga’s death. The title refers to an event near the end of the book, but what’s worth mentioning is that the titular miracle is not a miracle in the classic sense. A large number of people believe it to be a miracle, and that belief is beneficial to the protagonists. 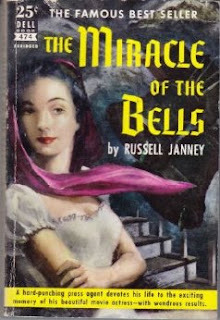 But unlike some of the other religious bestsellers of the 1940s (especially, The Robe, The Keys of the Kingdom, and The Song of Bernadette), The Miracle of the Bells is not primarily concerned with religion in and of itself. It also is one of the first novels on the list so far to take a stance on the big city vs. small town debate, and land firmly on the side of the big cities. While Sinclair Lewis’ Main Street did this, the book was largely focused on being an indictment of the small town mythos, while Janney’s novel is less consistently explicit. The big city perspective is largely part of the background, not the central feature. It is also the only bestseller on my review list from the 1940s that is not historical fiction. Besides Strange Fruit, it is the only one from the 1940s to take place in the United States (over 60% of the bestsellers on my list prior to 1940 take place in America). The most immediately apparent reason for this would be the Second World War. Events and personages in Europe and Asia were of immediate importance for the average American. The novel itself is part romance, part Hollywood-dream-come-true story. It got its own film version in 1948, with Frank Sinatra playing the Coaltown’s priest. The novel fell into obscurity. I haven’t been able to find evidence of any printings after 1973. It’s by no means the worst book I’ve read so far, but it’s by no means the greatest either. If you’re looking for something sentimental and light (not that light page-wise, although at only 500 pages, it’s a lot shorter than some of the other books I’ve reviewed) and you happen to have an old copy lying around, you’ll probably enjoy The Miracle of the Bells. Janney, Russell. The Miracle of the Bells. New York: Prentice Hall. 1946. Print. Janney is in The Dictionary of American Biography. Your public may have it. public library, i mean, sorry. I just checked. Campus library does have it. All the author/writer bio dictionaries are on the third floor, while the others are apparently on the second, hence my not seeing them.